Inti Runakunaq Wasin in Peru (IRW) is Quechua for "House of the People of the Sun". It is a non-profit organization based in Cuzco that acts as a haven for children and adolescents who live in extreme poverty. The home is open during the day and is run by a staff of volunteer teachers and social workers. Children are given the opportunity to voluntarily drop-in to receive help with homework, a warm meal and participate in a variety of classes and workshops that teach them valuable skills including jewelry making, leather working, cooking, music and English. IRW currently rents a small house and supports 50 children through their programs. However, there are still many more children working and living on the streets of Cuzco. Our foundation's goal, together with IRW, is to purchase a piece of land and build a bigger home in order provide support to more children and families. Women's weaving project in Peru, in the Ccaccaccollo Community: In January and March 2005, we developed and offered training courses to 123 people from four local communities just outside of Cuzco to work as porters and cooks on the Inca Trail. The women and wives of our cooks and porters from the Ccaccaccollo Community saw how we were working to provide jobs on the Inca Trail and approached us to ask us for support to develop a women's weaving project. Beginning in April 2005, our vacation groups began to visit this community as part of our tour, where they have the opportunity to meet the women and learn about all the stages of the weaving process; from spinning the sheep wool, to dying the wool using natural dyes, and participating in a weaving demonstration. Travelers are also given the opportunity to purchase high quality textiles directly from the women who made them. By working directly with the Ccaccaccollo community we are encouraging men and women to be proud of their cultural heritage, and enabling them to benefit from tourism in a way that avoids negative social and cultural impacts while providing economic benefits. Hogar Granja Sucre in Bolivia is a home that provides a positive environment for abandoned children in the city of Sucre. Thanks to a permanent staff and volunteers, the Hogar is home to more than 30 boys from 6 to 18 years old. Besides providing the basic needs of food, shelter, education and healthcare, they offer a safe nurturing environment and workshops that provide basic professional skills for future social integration into society. The boys are given the opportunity to participate in workshops, providing them with valuable skills including carpentry, metalworking, sewing, bread baking and how to care for flower and vegetable gardens and greenhouses. This enables the children to design their own products and grow their own food. Children attend the local school, but the Hogar also provides music, dance and theatre programs which are not offered as part of the national curriculum. The ultimate goal of Hogar Granja Sucre is to become self-sufficient however at this point they are still in need of our support. 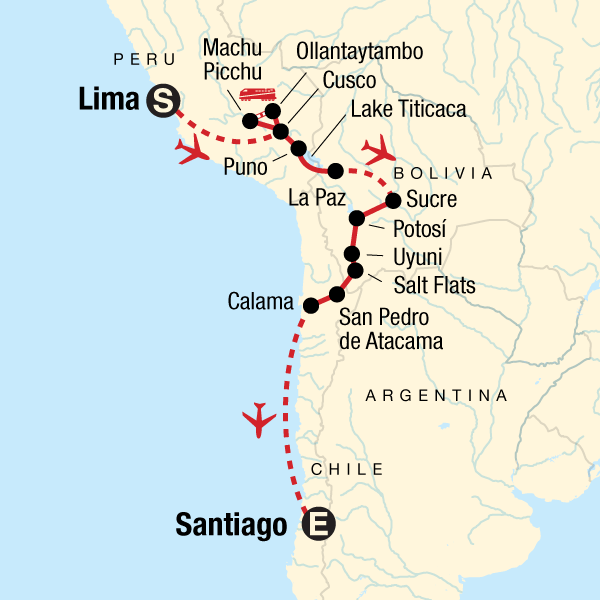 Machu picchu and the Uyuni salt flats. Pack well, all types of clothing are necessary and be prepared for the unexpected.